Binder's MAXIM System is the industry's first non-synthetic, environmentally friendly drilling fluid system that provides the benefits of water-based and oil-based drilling systems, but without the cost and complexity. The Maxim drilling system is a hybrid that lies on the continuum between traditional invert oil based muds (OBM’s) and dispersed water based muds (WBM’s). It is simple to run - it is very accommodating to the varied issues that are encountered downhole. It also can follow the path of OBM’s in that it can be taken back, stored and re-used if it contains barite and other expensive ingredients. Also, intense shearing is not required to make sub-micron droplets, meaning less capital requirement for manufacture. ECO-FRIENDLY - The Maxim system can be made “chloride free” using formates. It's primary ingredients are “GRAS” green. Therefore, the cuttings can be buried or better, used to build a new location and/or lease road. This feature brings the cost advantages to the forefront. If desired, the Maxim cuttings can be washed to a 99+ percent removal of drilling fluid with water – no surfactant or ashing required. DENSITY CONTROL - The Maxim system can operate with barite as the weighting agent or use brine fluids including formates, calcium chloride, magnesium chloride and bromides (including zinc bromide). RHEOLOGY CONTROL - There is a great deal of flexibility with respect to rheology, as the YP can be increased without seeing a commensurate increase to the PV. Further, the lubricant is a component of viscous sweeps and this feature furthers the efficiency of the chemical usage. FLUID LOSS - By itself the Maxim system has very low fluid loss, as it forms a very tight filter cake that routinely produces API fluid losses below 5 ml. With the use of PAK the fluid losses can be reduced below 2 ml. SHALE STABILIZATION - The lubricant, per se, is a very good shale stabilizer. Nevertheless, Binder has added several other stabilizers to this product to further enhance the shale stability. Drilling through the most water sensitive shales has not been a problem. This good stability advantage is also a plus with the low gravity solids – they are not made smaller by chemical degradation. 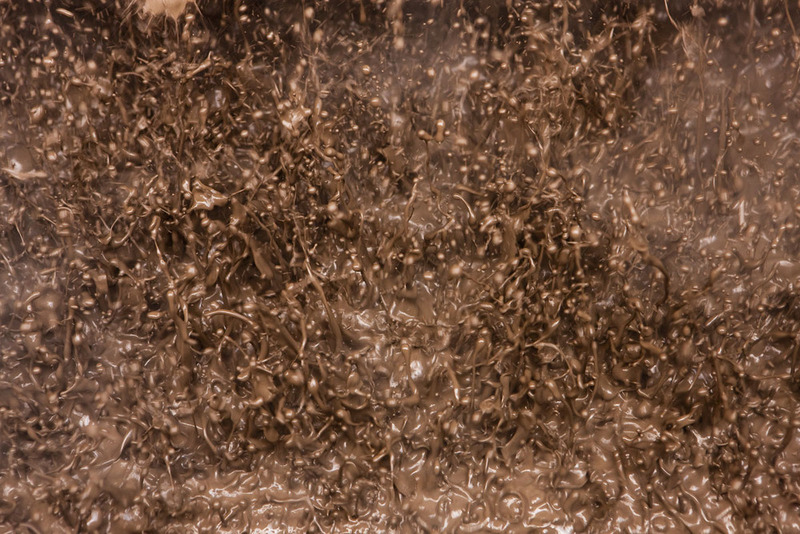 MAXIM Lubricants (left) vs Competitor (right) - MAXIM's lubricants disperse in water, allowing it to thoroughly and effectively lubricate the entire drilling system. LUBRICITY - It is well known that many of the issues encountered downhole can be overcome with a WBM, but without the lubricity of an OBM. This issue has been addressed with the Maxim system. Using PDS Super L and/or TNB 100 lubricants, MAXIM achieves better lubricity than WBM and OBM. to disperse in water ensures thorough and efficient lubrication of the entire drilling system.